The 2019 NFL Draft is less than a month away. This year’s Draft is in Nashville, Tennessee as the NFL has decided to continue the trend of bringing the draft bonanza around the country (buckle up for Vegas in 2020). As we have done the last few years, in the weeks leading up to the Draft we will be taking a position-by-position look at the Steelers roster and where their biggest needs lie in the Draft. Today we look at the running back position where James Conner is coming off a Pro Bowl campaign. However, despite Conner’s great season (that would have eclipsed the 1000-yard mark if not for an injury), the Steelers were next-to-last in the league in rushing. The need is there to add depth in the 2019 Draft. Make sure to check out our Prospect Profiles for an in-depth look at more players. 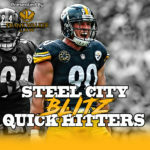 Also check out a special episode of the Steel City Blitz Podcast covering the Running Back position. The Le’Veon Bell saga is finally (thankfully) over. James Conner put together a Pro Bowl season last year and proved to be effective in both the running and receiving game. Conner is the clear-cut #1 back this season. That said, the Steelers need to add depth behind him. Their shortness of depth was exposed last year when Conner missed time with injury. Jaylen Samuels is a decent change-of-pace back who is better running out of spread sets and receiving than he is at pounding it up the middle. Samuels also needs work in the blocking and blitz pickup department. While Conner is the #1, Samuels is reminiscent of Mewelde Moore who can step in on a short-term basis but is best if used situationally. The Steelers need a capable #2 behind Conner that can run between the tackles and shoulder the starting load if Conner is injured. Rosie Nix is an anchor at fullback. Trey Edmunds started last year on the practice squad and was promoted to the roster after Conner’s injury but didn’t play any offensive snaps. When Edmunds was promoted to the active roster, Ralph Webb (a UDFA out of Vanderbilt) was added to the practice squad. The Steelers need a reliable #2 running back. The running back position is one of the most brutal in the league for injuries, and the Steelers have seen numerous times over the years that having just one bellcow back is not enough to navigate an entire 16-game season. They have their primary starter in James Conner and a third down/change-of-pace back in Jaylen Samuels. Now, they need a complementary #2 that can rotate with Conner to shorten the workload during the season and potentially step in and start a game or two. Given that the Steelers did not add a veteran running back in free agency, the likelihood they address this need in the draft has grown higher. That said, the Steelers have other more pressing needs for starting-caliber players, so it is likely they won’t address the running back position until the middle rounds of the draft. They have spent a good deal of time in the pre-draft process scouting and meeting with running back prospects. This year’s running back class is not nearly as top-heavy as last year’s class. It is entirely possible that no running backs get taken in the first round of the draft. That said, the last time no running backs went in the first round was in 2013 when the Steelers nabbed Le’Veon Bell in the second round. The need for a running back is not as high for this team as it was in 2013, but it is still a position they should address in the mid-to-late rounds to add a third back to the stable. In just the first two days of pre-draft visits, the Steelers had five backs come to Pittsburgh. Alabama’s Damien Harris and Penn State’s Miles Sanders (who played at Woodland Hills High School) visited on Monday. Tuesday’s visits included Florida’s Jordan Scarlett, Miami’s Travis Homer (Prospect Profile), and Ohio State’s Mike Weber (Prospect Profile). Running backs coach Eddie Faulkner attended Pro Days at Kentucky and Pitt, which puts Benny Smith and Quadree Ollison on the Steelers’ radar.